It’s hard to change twenty years of seriously entrenched pop culture though. Scholastic isn’t going to update their paperback editions over here in the United States to match it. I love Harry Potter. It was a fun mystery series for kids that had a great world built behind it. Fun characters, clever plotting, and some nice examples of standing up for what’s right and fighting evil and such. I also like taking titles or words and mispronouncing them or saying them ALMOST correctly. Saying “Me-Moyers” instead of “Memoirs,” “Old Tomato” instead of “Ultimatum.” That sort of thing. 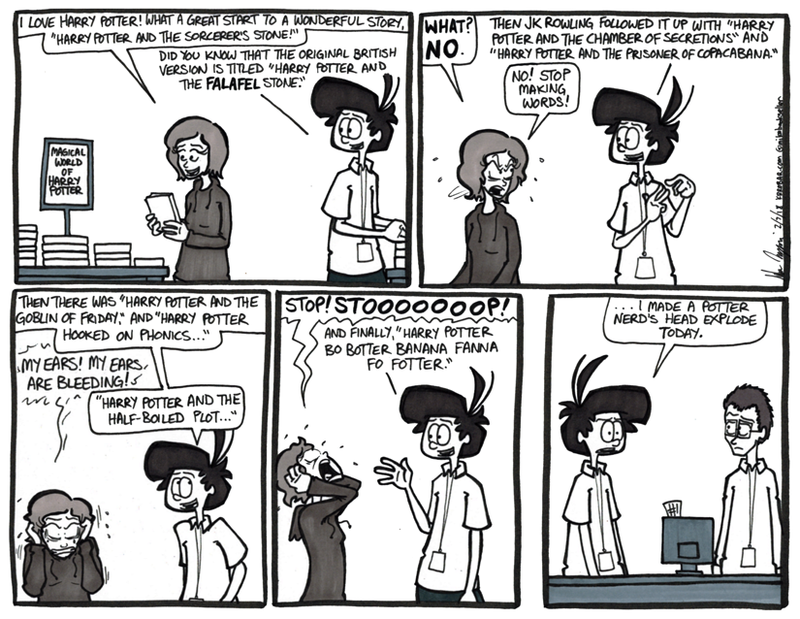 The other night I was putting in the second Harry Potter movie to play for my wife to watch, and I called it “The Chamber of Secretions” and this whole comic snowballed from there.